There are 2 kinds of packing boxes,black and white color.Sent at random. ACTIVE NOISE CANCELLING- Internal precision noise reduction headphones wired circuitry effectively eliminates up to 85% of background noise. Ideal for use when traveling by airplane,working in a noisy environment (such as an office or loud coffee shop), or simply when encountering noisy environments in daily life. 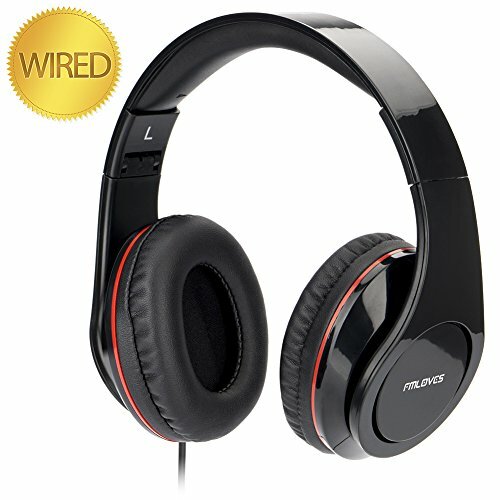 PREMIUM HIFI SOUND - Stereo Wired Headset premium 40mm diameter stereo driver units ensure a high quality auditory experience featuring rich bass, as well as powerful and balanced sound. EXTREME COMFORT FOR EXTENDED LISTENING-Super Lightweight over-the-ear Headphones and ultra-soft ear pads deliver a comfortable, fatigue-free listening experience even for extended periods of time. Headphones with Mic let your hand free. PORTABLE CONVENIENCE - Foldable Headphone in combination with the included travel case provide a highly portable listening solution. GOOD TRAVEL HEADSET CHOICE. If you have any questions about this product by FMLOVES, contact us by completing and submitting the form below. If you are looking for a specif part number, please include it with your message.